Sighted a Possum in the back yard around 8 am on January 11, 2017, in Brampton, Ontario (North Park Drive and Nuttall Street area). The sighting was following a very windy night, with temperatures hovering around the freezing mark. Possum spotted again around 7:30 pm on the same day in the same location. Outside temperature recorded at 5 degrees Celsius. The Possum appeared to be the same in size and colour at both sightings (large in size, likely an adult, approximately the size of a large house cat; light grey colour with a white face). During both sightings, the possum appeared to be eating the grass, or potentially bugs under the grass (all snow had melted). We have a fairly large possum visiting nightly in the Dixie / North Park area - seems very sweet. 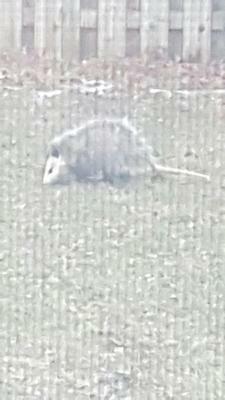 The Virginia Possum is there now for shelter. the odd grass grub and perhaps mice. The good news, that unlike skunks and raccoons this animal rarely carries rabies.